Punjab is known as the land of warriors, which gave birth to warriors like Bhai Sukhdev Singh Jhamke. Bhai Sahib was born in the year of 1952, in the house of Sardar Inder Singh and the womb of Mata Pritam Kaur in the village of Jhamke, District Amritsar. Due to the family closely being linked to Damdami Taksal and the teachings of Sikhi from their mother and father, Bhai Sahib from childhood had a love for Sikhi and its values. Bhai Sahib was the eldest of 4 brothers and 2 Sisters. Bhai Sahib completed his primary education at a government school in Udhoke. Bhai Sahib was strict and if he had said something then he should make sure he followed it through too. When Bhai Sahib reached the age of 17, in 1969 Bhai Sahib went to Bombay to earn an honest living as a truck driver. Due to Bhai Sahib’s honest and hard work Bhai Sahib was able to open a small transport business. As Bhai Sahib’s business was going well, Bhai Sahib also helped his younger brothers get involved in the transport industry. In 1971 Bhai Sahib got married and later saw the birth of his two sons and two daughters. In 1980-1981 when Sant Jarnail Singh Ji Bhindranwale came to Bombay for Gurmat parchar, Bhai Sahib found himself in peace upon hearing the katha of Sant Ji. Bhai Sahib was disappointed with the Government of India when they tried to arrest Sant Jarnail Singh Ji while they were in Bombay, in which the Government of India was unsuccessful in. During the Dharam Yudh Morcha Bhai Sahib would regularly Travel to Punjab from Bombay. Whilst visiting Punjab, Bhai Sahib would also go meet Sant Jarnail Singh Ji Bhindranwale and share his views as well as listen to Sant Ji’s. During the visit, Bhai Sahib gave Sant Ji all that money which was given to Bhai Sahib by the Sikhs of Bombay and his own family, for Panthic Karaj. The Prime minister of India at that time was Indira Ghandi, who sent her army with tanks and cannons to attack Sri Darbar Sahib, this attack wounded many Sikh Generations yet to come. In these black days of June 1984, Bhai Sahib was in Bombay, as soon as they got the news of the attack, Bhai Sahib passed his business responsibilities to his brothers and made his way to Punjab. Then the Sikh Genocide of November 1984 challenged many Sikh youth to take part in the armed struggle. Looking at the bad times Bhai Sahib tied his Kamarkasa to punish the Enemies of the Sikh Panth. Within the Sikh Freedom Movement, Bhai Sahib joined the top Jhujaroo Singh’s and started punishing the anti-Sikh elements all over Punjab. The police never fully succeeded in arresting Bhai Sahib, once the Kotwali police in Amritsar arrested Bhai Sahib but at the police station Bhai Sahib fooled the police and managed to jump over the wall of the police station and escape. The singhs of Khalistan Commando Force highly respected Bhai Sahib. Once at Sri Tahli Sahib in Amritsar, the CRPF and Punjab Police surrounded Bhai Sahib and fellow singhs, but the locals loved Bhai Sahib and they helped the singhs escape from the area on that day. When Khalistan Commando Force’s chief Bhai Tarsem Singh Kohar was arrested, the following day he had announced Bhai Sahib to take his place. There is a lot of sewa Bhai Sahib did, for example, Bhai Sahib did the sewa of 7 Nishan Sahibs at 7 different Gurudwara Sahibs, where there were no Nishan Sahibs before. Whenever Bhai Sahib received the news of a daughter from a poor family was to get married, Bhai Sahib as the chief of the Khalistan Commando Force would send the family ₹ 11,000 to help with the cost of the wedding. Bhai Sahib was also planning to eliminate Rajiv Ghandi on his trip to Punjab. But the Tamils beat the Singhs to it and assassinated Rajiv Ghandi. Bhai Sahib had a lot of love for the All India Sikh Student Federation’s president Dr. Jagdish Singh Bhuttar. In the village of Sadhpur, the locals had forcefully occupied the 25 acre land which belonged to the local Gurudwara, Bhai Sahib went to the village and freed the whole land of the Gurudwara and gave the Sewa to Baba Sewa Singh from Guru Ki Ber to refurbish. It must be said that Baba Ji attained Shaheedi, in 1992 fighting the Indian security forces. When the Sikh Freedom Movement was in its full swing, a duet Singing group from Ludhiana sang dirty and lustful songs in Punjab, on the land of the Sikh gurus, which made the Singhs angry. The name of this duet was Amar Chamkila and Amarjot. The Singhs had sent a message to the duet to stop singing dirty songs or the Singhs will kill them. The frightened duet came to Amritsar and apologized and promised not to sing dirty songs again, in fact the duet said that they will release a Dharmik album. As time went on the duet started singing dirty songs and spreading their dirt across the land of the Sikh Guru’s. Bhai Sahib had enough and ordered Bhai Gurdeep Singh Deepa Heranwala to eliminate the dirt-bag duet. Bhai Gurdeep Singh Deepa Heranwala got on to the Motorcycle with the other Singhs on the 8th March 1988 and by the afternoon that day Chamkila and Amarjot had been assassinated. Once Bhai Sahib with the help of fellow singhs attacked the base of Ajit Phoola called Singh Bele, Ajit Phoola managed to escape but his four gang members were killed. To avenge this attack, Ajit Phoola took 500 soldiers of Indian security forces and surrounded the Jhamke village. At that time, none of Bhai Sahibs family members were present at the house. So Ajit Phoola trashed Bhai Sahib’s house by breaking furniture and at the end setting fire to the whole property. After this Ajit Phoola, who was a sheep in a lion’s skin left the village. Bhai Sahib was planning to import huge number of weapons and pump the Sikh Freedom Movement but within these days of planning, fellow singhs were travelling on a tractor when all of a sudden the tractor tilted over, due to this accident many singhs were seriously injured. To arrange care for the injured singhs, Bhai Sahib had to drop out that plan. Some days later on 12th April 1989, Bhai Sahib was staying alone in a farmhouse in the village of Nangli near Mehta Chownk, District Amritsar. Just like Baba Manochahal, the enemy mixed poison in milk and gave it to Bhai Sahib, the enemy, then had the Indian security forces surround the farmhouse. The poison slowly started to take its effect, when Bhai Sahib realized that he was surrounded by the Indian security forces he grabbed his assault rifle and after doing Ardas, Bhai Sahib replied to the enemy bullets with bullets from his assault rifle. For many hours Bhai Sahib shouted war cries of “Bole So Nihal, Sat Sri Akaal” and fought like a brave lion that turned the teeth of his enemy yellow. The ammunition of Bhai Sahib was running low and once finished Bhai Sahib pulled out his Mauser pistol and put it near his ear and took his own life instead of being a prisoner of war. Bhai Sahib had become a Shaheed of the Sikh Freedom Movement and joined many sons of Guru Gobind Singh Ji in his laps. The world will forever remember this fallen soldier and general of Khalistan. The singhs of Khalistan Commando Force avenged the shaheedi of their general after 15 days. There was a sugar cane farm opposite the farmhouse in which Bhai Sahib had been staying before his shaheedi, the singhs of Khalistan Commando Force stationed themselves in these farms and kept an eye on the movement of the family that had sold themselves to the Indian government and poisoned Bhai Sahib. Soon the man who betrayed Bhai Sahib was killed by the singhs, not even the guards that were given to him for protection could save him from the singhs. Later it is said these singhs attained shaheedi in an encounter on Ghuman Road, near Mehta Chownk. After Bhai Sahib attained shaheedi, the Punjab police arrested Bhai Sahib’s father, Sardar Inder Singh and Chacha, Sardar Makhan Singh. Both men were inhumanly tortured by the police for 10 days. After intense integration both were sent to Gumtala Jail on fake cases, they were released after a month. It was Beanta Butcher that was in power in Punjab. 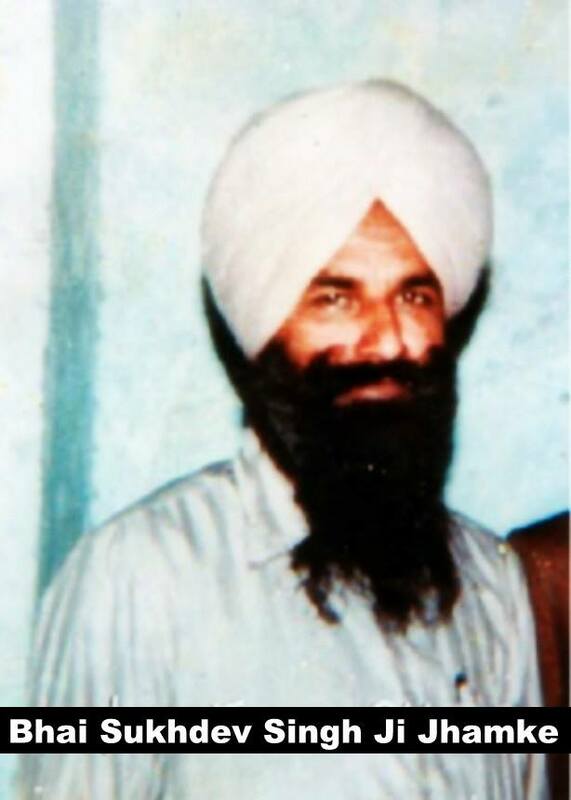 After being released, a week later Sardar Makhan Singh was arrested again by the Punjab police and till today no one knows where he was or killed in a fake encounter. Once More Beadbi of Guru Sahib Saroop Village Najju Shah Wala PO Sher Khan Wala, District Ferozepur.